Michael Spindelegger succeeds Josef Pröll as leader of the conservative party and Vice-Chancellor. Who will be in charge of the Minister of Finance, is still not clear. Yesterday Josef Pröll announced to resign from all his political functions: as leader of the ÖVP, as Minister of Finance and as Vice-Chancellor. 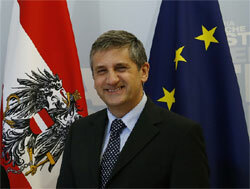 After the resignation, Chancellor Werner Faymann (SPÖ) foreclosed a reelection and emphasized to be willing to continue the coalition between the social democrats and the conservatives.